Sue Parry, one of the glass artists in the centre, stopped by a couple of weeks ago and asked if she could commission a photo frame. "The only thing is" she says "I need to take it to LA next Wednesday"
So back to the drawing board, and it's then I say," why don't I just make it like the inside of my cabinet door, I think that would suit.."
Some things can start with a simple move around of some shelves.. I had put some new lighting in the Gallery part of my workshop, and it's looking pretty good, but in doing this the shelves needed dusting off, so I set about dusting, and in moving things around, found that I had a chopping board under a Wedding Archive box...I just hadn't picked up on it being under there..
Later that week, in walks Wendy, and straight away says she likes the Oak board on the shelf. When I tell her that it is all finished by hand, as in planed all round, then I use a scraper to finish the surface and corners. Then after oiling with Mineral oil, I stamp my 'mark' in the middle of both ends and finally I burnish the corners and edges with a small block of the same timber, this gives a wonderful natural shine to the surface.. It takes a bit longer by hand, but worth the effort and you can see it..
Based at the Ruskin Glass Centre, means that there is always something going on, and leaving the doors open means that anyone can walk in at any time. I'm okay with this, if I need to do some machining on the bandsaw for example, then I just shut the door and if I'm making lots of noise I'll turn the key. Do whatever needs doing then unlock the doors afterwards. That way people in the centre don't hear my loud machinery, and I get dedicated, safe time on the machines. I'm going to work out some kind of card system to put in the windows, This should make it easier for the communication between myself and a visitor. Anyhow, over the last few weeks I've had a number of visitors, who have made some fused glass in a workshop here at the Glass Centre, and was after some wooden blocks to stand the pieces in, quite a straight forward job. But one that a larger company probably wouldn't bother with..
First evening class piece finished..
She came to my workshop with a few ideas, but not really sure which one would suit the piece, it was then that I thought that if she came onto my evening class, we could work out the design as she made it, to ensure she got exactly what she wanted. 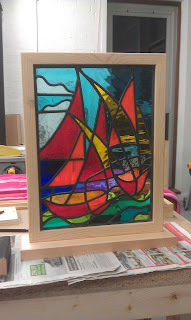 And tonight, Rebbecca has finished her Pine wood frame, made for the stained glass that she made in another class at Ruskin Glass Centre, with Paul Floyd. Well, we sampled the Black Stain, and tried out some Oil, Rebbecca has taken the samples home and is going to live with it for a while, before comiting.. I think it looks great natural.